FIRE > Newsdesk > Don’t Forget to Submit Your Essay to FIRE’s High School Essay Contest! Don’t Forget to Submit Your Essay to FIRE’s High School Essay Contest! Don’t forget to submit your essay to FIRE’s High School Essay Contest! The deadline is January 1, 2014, so you still have plenty of time to enter—but be sure you do, because FIRE is giving away $20,000 in college scholarships to high school juniors and seniors planning on attending college! 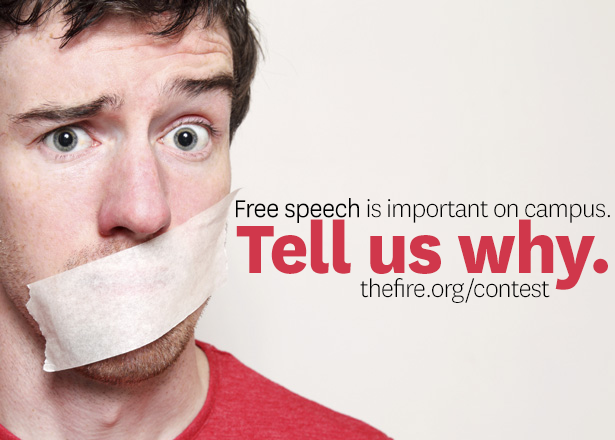 To view the full contest rules and entry form, visit thefire.org/first-amendment-educational-resources/essay-contest. We look forward to your entries! Current high school juniors graduating in 2015 and high school seniors graduating in 2014 who are U.S. citizens or permanent residents and plan to attend college are eligible to submit an essay for consideration. Deadline for submissions is January 1, 2014. Winners will be announced by January 31, 2014. Why is free speech important at our nation’s colleges and universities? Using examples from both videos, discuss how censorship of student speech is incompatible with higher education. Your essay should be 800–1,000 words and should stay on topic. Essays can be submitted on the contest page: thefire.org/first-amendment-educational-resources/essay-contest.